My lab's research interest is in the broad area of structural bioinformatics with a major focus on protein-DNA interactions. Protein-DNA interactions play a crucial role in the regulation of gene expression. Knowledge of protein-DNA interactions at the structural-level can provide insights into the mechanisms of gene regulation and can guide the design of novel therapeutic molecules. 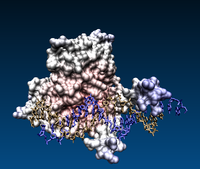 We aim to address several important questions regarding specific protein-DNA interaction: 1) what are the structural features for specific protein-DNA interaction? 2) can we model specific protein-DNA interactions based on knowledge learned from existing protein-DNA complex models? 3) can we accurately predict transcription factor (TF) binding sites with protein-DNA interaction models (also called structure-based approach)?